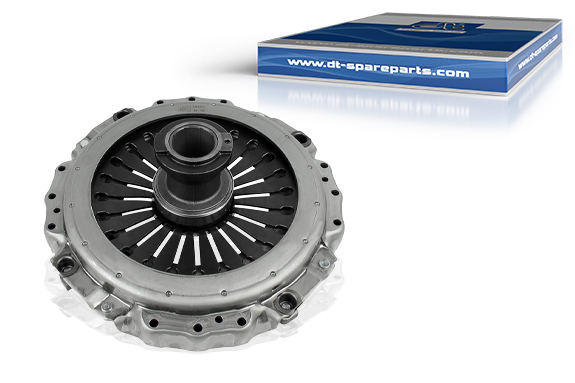 The clutch cover is an essential component of the clutch system presenting a separable connection between the engine and the drive train, and furthermore serves the transmission of power. Alongside the flywheel and the clutch disc, the clutch cover forms a friction system and is fixed to the flywheel via a screw connection of the housing. In doing so, the clutch cover ensures the transfer of the engine torque via the clutch disc to the gear shaft by pressing the clutch disc onto the flywheel. Furthermore, the clutch cover acts as an overload protection (e.g. switching errors) for the whole drive train. The obscured release bearing is the transmission element between the rotating clutch cover on the engine’s part and the fixed actuator system on the gearbox’s part. It is centrally managed and equipped with a self-centring mechanism. First of all, it is important to check the condition and the wear and tear of the clutch components. The clutch disc and the flywheel must be controlled for planeness, cracks and scoring. Where there are deviations, it is necessary to revise (e.g. surface grinding) or renew items. After this grease the friction surfaces, fix the clutch disc with the assembly pin and then install the clutch cover with the stipulated torque. The guide sleeve of the release bearing must not be greased. Depending on the type of vehicle, it is necessary to carry out a teach-in process to set the clutch play and to calibrate the wear values in the control unit.